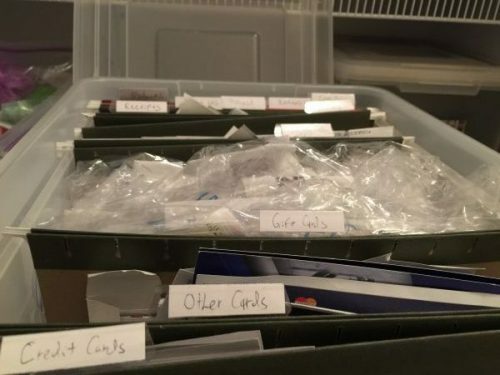 Staying organized is extremely important when manufacturing spend. Why? Because, the point of manufactured spending is to move around large amounts of money in a way that earns heaps of rewards. When cycling those thousands of dollars through multiple channels, there is a risk. If any of that money magically disappeared, that would be a bad day. That’s why keeping track of your the bank’s money is a vital process in this game. Quick Note: If you’re a disorganized person, I highly suggest staying away from this game. 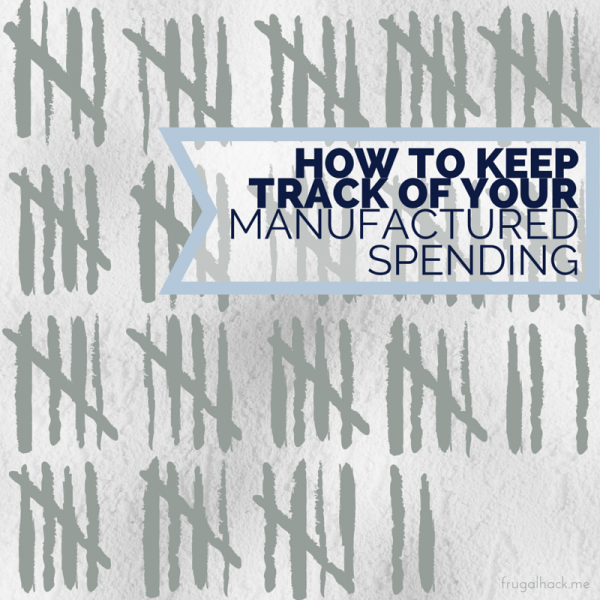 If you don’t already have a way to keep track of your manufactured spending, don’t worry. This post will show you how to do it. More like, this post will show you how I do it, which I think works pretty well. 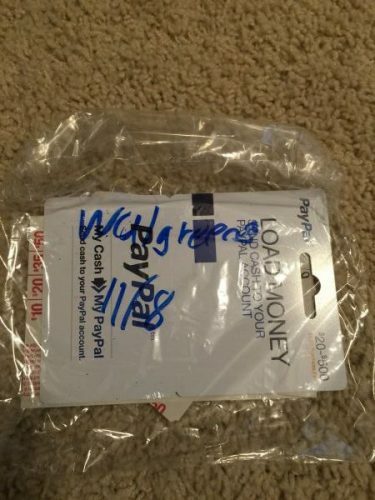 I put the gift card (or whatever it may be) and the receipt into a small sandwich bag. I then write the date and store name on the bag. Finally, I put the bag in my MS box by date. It’s that simple. If you don’t already have a file box, you can get one on Amazon . They’re super cheap. Disclaimer: That is an affiliate link. Thanks for the support! I use YNAB for my day to day budget, but I also use it to budget my MS. That program makes it extremely easy to track credit card transactions, money orders coming in and out, gift cards, Paypal, and everything in between. It’s an all around awesome budgeting program. If you want to learn more about tracking MS with YNAB, check out this link. There’s quite a lot to it, so let’s go over it column by column. Date: This is the date that the purchase was made. Cost: This is the total amount that can be liquidated. For example, if you bought a $500 gift card that cost a total of $503.95, you would enter $500 for the cost. That’s because the $3.95 is a fee and you cannot liquidate the fee. Fee: This is the fee that the item has ($3.95 in the above example). For this column, there is a drop down box that has the most common fee amounts as options. Store: This is the store that the item was purchased at. Again, there’s another drop down menu with common stores in it. Purchased: This is where you can write what you pruchased. For example, if you bought two $500 gift cards, you would write “2 – $500 gift cards”. Multiplier: This is what the card multiplier is. If it’s a 1X card, put 1. If it’s a 5% cash back card, put 5. The drop down on this column has the most common multipliers as options. Points Earned: This is the points, miles, or cash back that you earned from your purchase. There is a formula in this box that takes the cost and fee and multiplies it by the multiplier. Card: This box has drop down menu that lists all of the cards I programmed into it. For example, see below. You can program any card into this box. 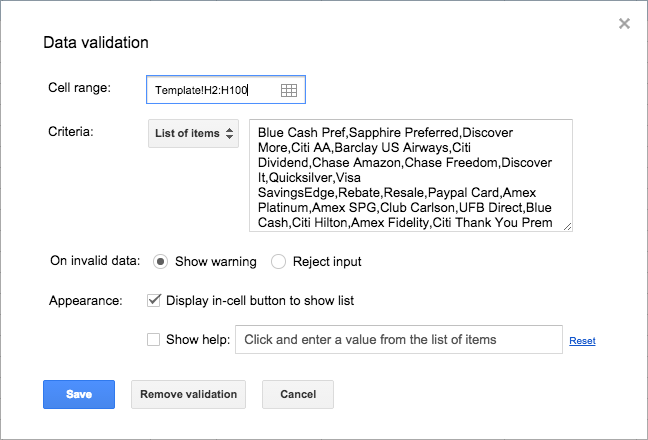 Program: This box has a formula that automatically enters what type of rewards you earned by using the card entered in the previous box. Notes: This box is for any notes you pay or may not have. Earned This Month: This box shows you just how many points, miles, and cash back you earned that month. It’s completely automatic, because the formula pulls the numbers from “Points Earned” based on which program the spreadsheet says it’s in. It’s pretty slick. Go to Data > Validation. 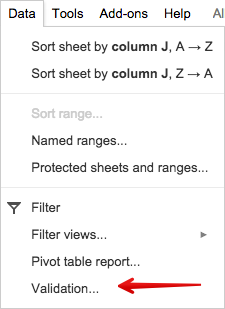 Select your cell range which should look like, “Template!X2:X100″ with X being the column you want to edit. In this example, it’s H, since we’re editing the credit cards. In the criteria box, you can enter the cards that you want tracked. Separate the cards by commas, but don’t put a space between the comma and word (e.g. card 1,card 2,card 3). Select Save and you’re done. Double click the box whose formula you want to edit in X2 with X being the column you want edited. Drag the bottom right corner of X2 to X100 to automatically update the rest of the cells in that column. The formula for the “Program” box looks like, =If(H2=“CARD“,“PROGRAM“, “”). CARD is the name of the card under the card column. These cards need to match up identically to the cards you put into the drop box menu. PROGRAM is the name of the program you want entered when you select a certain card. For example, if you want the program to be Ultimate Rewards when you select Ink Bold from your card menu, then you would replace PROGRAM with Ultimate Rewards. =If(H2=“CARD1“,“PROGRAM1“,=If(H2=“CARD2“,“PROGRAM2“, “”)) and continued. Just replace “” with =If(H2=“CARD”,“PROGRAM”, “”) every time you want to add another card. Every number box under “Earned This Month” has a formula attached to it. This is because the boxes automatically pull the points you earn per transaction into the monthly total. You will likely want to edit this box to work with the programs you have programmed into the program formula. Can I say program any more times in that sentence? Here’s what the formula looks like, =SUMIF(I:I,“Ultimate Rewards”,G:G). This formula adds every box in column G that says Ultimate Rewards in its corresponding column I to the total. So, if you add more programs with the previous formula, you will want to change the Ultimate Rewards part of this formula. Quick Note: The Cash Back section under “Earned This Month” automatically divides the total number by 100 to convert the points/miles to dollars. There isn’t a perfect MS tracking solution for everyone, so if the above methods don’t sound like something you want to do, don’t worry about it. You don’t need to track everything the way I do, you just need to keep track of it some how. If you already have a system in place, how’s it work? What do you use to track everything?